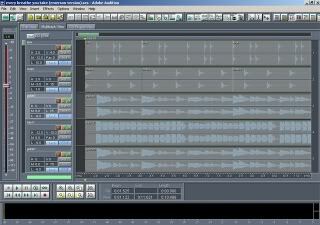 I used Adobe Audition version 1.5 in my recording, mixing and mastering of audio tracks. I get this one since 2004 and this is one of the best audio software gears that I have. a. Audio wave editing view – of all the recording softwares I used, this is the only software that gives the best editing features. One of the editing features I really is the Noise reduction feature. This noise reduction feature enables the engineer to clean out the tracks such as removing background noise from the recording. Plus I find it very user friendly to use. Other important audio editing features are complete such as amplification of signal , compression, effects. One of the great features of this software is the batch editing feature, it means you have a single command for all audio editing work and have it done automatically. This is particularly important when converting a lot of wav files into MP3. It can be used to convert many stereo channel songs to a mono songs. This makes the audio editing work very easy. Although as I write this review, there are already Adobe Audition 2.0 released in the market. I can say that I am satisfied with the audio editing features of Adobe Audition 1.5. The audio editing features is very useful in the mastering process. Mastering process deals with a single wave. Unlike in the mixing process where there can be several waves to work it. Mastering process works with a single wave. The main process of mastering can be easily done in Adobe audition 1.5. Major important steps such as noise reduction , amplification, compression, EQ can be easily executed. One of great advantage of this software is the ability to work with high quality plug-ins. One of the most useful plug-ins that I used, the Sony FX plug-in from Sounforge can be easily integrated into this audio software. Other great plug-ins such as sonic maximizer and Wave plug-ins can work also with no hassle. The most important is the multi-track recording feature. This works very well and ideal for low budget quality recordings. Adobe audition can work with Soundblaster Audigy Soundcard which is a good, cheap but a very decent soundcard. I do not have an exact figure of how many tracks it can support. But as I checked before, it can support up to 64 tracks. And I think this 64 tracks is enough. The multi-track feature enables you to work with plug-ins and all features that can be found in audio editing feature. The most satisfying feature is the “lock down”. This is where you can locked tracks with heavy effects to speed up the multi-track play back and recording. Locking tracks improves the performance of your work. There is a need to lock down tracks if during play back it will slow down the computer processing. It is very easy to work with multi-tracks and to record the track one by one. Also there are friendly “help” features which is very clearly explained how to do the process. c. CD project view – I used this burn high quality CD audio. It is very easy to load tracks and I find this burning process very efficient and produces great quality. 1. This software uses a little amount of RAM and CPU usage typically for very modern computers. It is because this software was designed to work efficiently with slow version of Pentium computers before. But today with fast computers, this is a very memory and processor efficient software. 2. Affordable with lots of features. 1. If you like to video with audio or deals with video, this is not a recommended software. Instead go for a more advanced ones like Pro tools and others. 2. If you like to work with MIDI, this is also not a recommended one as this type of softwares gives a very limited features to work with MIDI. Overall, this is a great audio recording software and have been a standard like the Pro Tools in modern recording industry.